Hi Lovelies, hope your today is going fine! 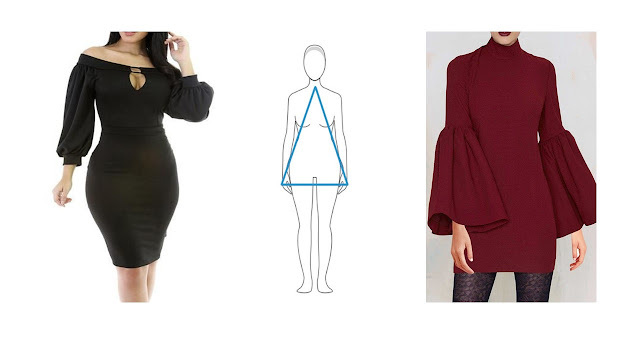 This post is a continuation of our discussion on understanding the woman's body shape and this post will give you in-depth understanding of one of the body shapes,The Pear Body Shape. Also known as the triangle body shape, hip is wider than the shoulder/bust area; hip curves are very prominent and usually with somewhat cinched waist. Over 20% of women are said to have the pear body shape. In some cases, pear body shape have been mistaken for hourglass. To balance up this body shape, accentuate your shoulder area with tops that have volume like capes, puffy sleeves, highly decorative tops as this will create fullness at the upper half of your body. Padded push up bra will also help create fullness at your bust area and then be sure to consciously go for dresses and tops with neckline that will create the illusion of big bust for example, turtle necks, scoop neckline, cowl necks. Be sure to avoid bottom wears that have volume or so much details such as gathered skirts, pleats, pockets etc and if you will rock gathered skirts for example ensure the gathers, pleats are minimal. So the essence of going for bottom wears will minimal details is to avoid over bloated hip illusion. Ball and prom dresses are not your best friends. A pencil skirts or pants are likely to be your best bet. Is this your body shape? If not, then see the next post on "the apple body" shape. Note,this post is a style guide.